30 years; 30% off, on 30 select units. Photo/Spec's/Features Outstanding 2008 2550 31'2" 7820 $36,999. $ 6,922 $29,777. Photo/Spec's/Features Luxury 2008 2870* 34' 8820 $39,711. $ 7,729. $31,982. Photo/Spec's/Features Quality 2008 3070* 34'10" 9150 $42,721. $ 7,844. $34,877. Photo/Spec's/Features Tri-Slide 2008 3300TRE 34'8" 9710 $51,304. $ 8,322. $42,982. Photo/Spec's/Features 2007 3305 34'10" 9650 $44,500. $18,623. $25,877. Weights shown are 'dry'.w/no options. Weigh your loaded trailer for accuracy. This type of travel trailer is designed to fit a "fifth wheel" hitch that is installed in the load bed of a pickup truck. The system is essentially a smaller version of the concept used for all long range commercial trucking, and makes the fifth wheel trailer the easiest handling vehicle in the towable RV category.The fifth wheel trailer features a distinctive raised forward section, that extends over the truck’s load bed, creating an internal floor plan that is like a split-level home. The typical use for the forward section of the fifth wheel trailer is as a master bedroom, and with a full eight foot width, and almost as much space in the length of this area, the effect of the floor plan is very impressive.The fifth wheel tends to be among the larger RV models, with every convenience feature required for up to eight people. Priced from about $15,000., it can last for many years, and with the option of a fully winterized construction it is suitable for all-round use. Brown's RV stocks these Fifth Wheels: Aljo Model 2705, Model 3105 Aljo, Model 3305 Aljo. All Models also available in the Nomad Line by Skyline. The travel trailer category was the first of the recreational vehicles ever developed, and remains the most popular of the many types of RVs in use today. Ranging from 12 to 40+ feet in length, smaller trailers can be towed by compact cars, but as the size and weight increases, the towing vehicle must possess a correspondingly greater power and mass. The mid-size travel trailers, in the 18-24 foot range, tow easily behind properly equipped full size cars, and are a pure pleasure when towed behind a van or pickup truck. With interior facilities depending largely on the size and cost of the vehicle, the travel trailer category opens up at around $13,000. and averages about $25,000.00for a mid-size unit. Sleeping capacity varies with size, but trailers typically accommodate six to eight adults in comfort, and contain full kitchens, bathroom facilities, and the comforts of a pressurized hot water system with shower stall, of course. The "king of the road" for many RV families is the full-size travel trailer, in the 24 - 34 foot range. These vehicles are easily towed by the heavier duty vehicles, from full-size sedans, suitably equipped with transmission cooler, heavy duty suspension, upgraded electrical system, and equalizing hitch, to any number of RV - compatible vans and trucks. The full size travel trailer is built for mobility, and with an excellent weight distribution, can often be the easiest of the travel trailer sizes to tow! Brown's RV stocks The Weekender line of Travel Trailers by Skyline. Aljo Model 264, Model 272 Aljo, Nomad or Aljo Model 2960. Also, Aljo Limited Model 266.. Inside, the full size travel trailer offers spacious accommodation with a full range of optional accessories that let you turn your RV into nothing short of a "castle on wheels." Is it any wonder that so many people select this category of travel trailer … you can tour the continent, set up seasonal living quarters close to home in the summer, and winter in the sunny south … you can even choose your favorite campground, and use the full size travel trailer as a movable cottage! Toy Haulers (Toy Box, Gear Box) If you are an RV enthusiast who wants the latest innovations, the best storage capabilities, and graphics that stand out in a crowd...look no further than TrailRider RVs. 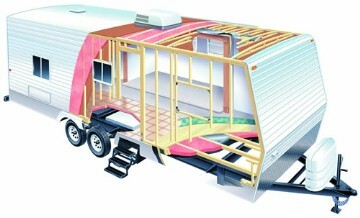 These state-of-the-art ramp trailers combine exceptional storage space with comfortable living. Notice the extra large fresh water capabilities...the Onan generator options...the electric lift beds...all of these tell you these aren't your parents' RVs. Brown's RV stocks these Toy Hauler Travel Trailers by Skyline: Aljo Way-Lite Model 187, Aljo TrailRider Model 199 Way-Lite, Aljo TrailRider Model 219 Way-Lite, Aljo TrailRider Model 240 Way-Lite, Nomad Rampage Aljo Model 281 TrailRider, Aljo Model 286 TrailRider,Aljo Model 321 TrailRider. Brown's Recreation Center stocks these Toy Hauler Fifth Wheels by Skyline: Aljo TrailRider Model 289, Aljo TrailRider Model 289, Aljo TrailRider Model 395. Brown's Recreational Center is happy to custom order any Skyline Aljo or Nomad Product at the same current model year discount price offered. We rotate RV Stock frequently. 190W Weekender, Model 241W, 258W Weekender, Model 290W. Lite Travel Trailers: Nomad Model 180LT, Nomad Model 239, Nomad, Model 259LT. Model 240WL Aljo TrailRider Way-Lite or Nomad Rampage. Brown's RV stocks or custom orders these NOMAD Toy Hauler Travel Trailers by Skyline: Nomad Model 187WL Way-Lite Limited, Nomad TrailRider Model 199 Way-Lite, Nomad TrailRider Model 219 Way-Lite, Nomad TrailRider Model 240 Way-Lite, Nomad Rampage Model 217 Way -Lite, Nomad Model 243 Rampage,Nomad Model 281, Nomad Model 286, Nomad Model 321 TrailRider. Brown's Recreation Center stocks or custom orders these Toy Hauler Fifth Wheels by Skyline: Nomad Rampage Model 289, Nomad Rampage Model 299, Nomad Rampage Model 337, Nomad Rampage Model 385, Model 395. Nomad Rampage. Northern California's Premere Skyline RV Dealership! We will custom order any Skyline Product for you. Let Us Earn Your Local and Long Distance Business! Northern California, Sacramento, San Francisco Bay Area, Santa Rosa, Clearlake.